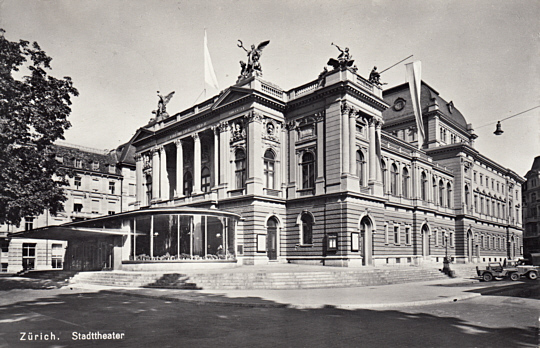 Built 1890-1891 as "Stadttheater" by Ferdinand Fellner & Hermann Helmer. 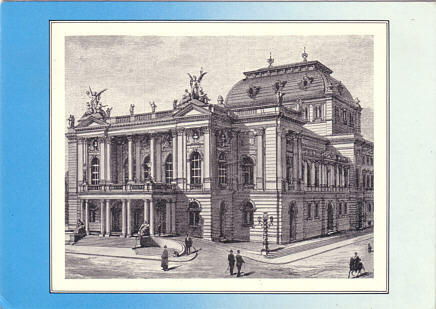 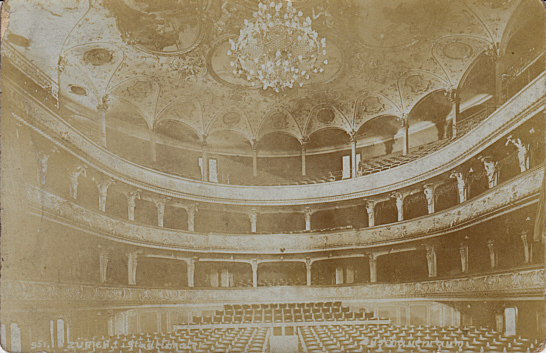 After the old 1834 Stadttheater had been destroyed by a fire on 1 Jan 1890, a join-stock company "Theater-Aktiengesellschaft" founded the building of this new theatre, with a communal subsidize of only 10% of the construction costs. 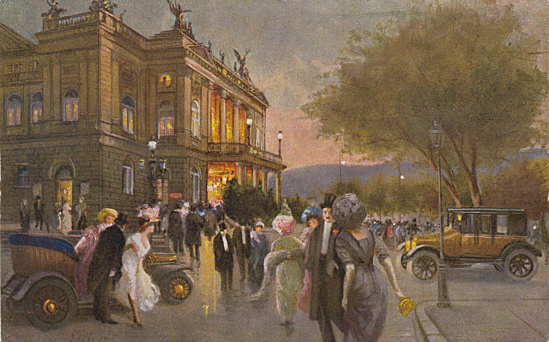 Opened 1 Oct 1891 with Rossini's "Guiglielmo Tell". 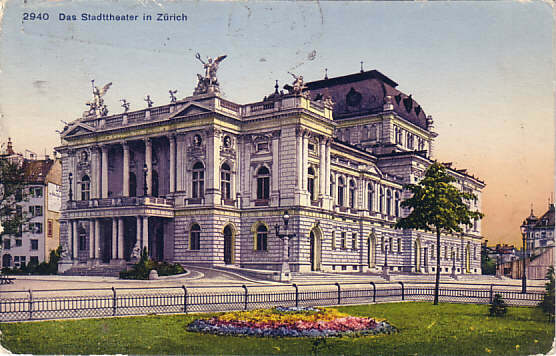 1936 renovation and extensions. 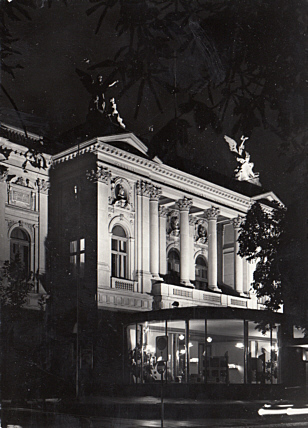 Renamed "Opernhaus" in 1964. 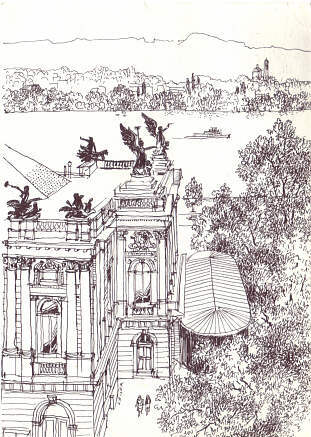 In the 1960s, there were plans to destroy the building and build a modern opera house. 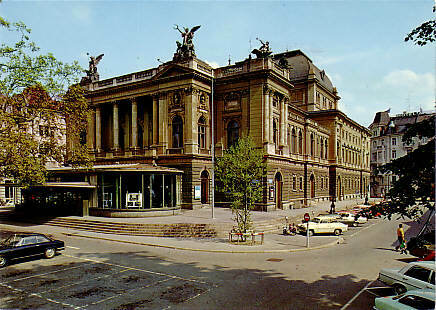 After years of political struggle it was decided that the old building exterior and the auditorium would be saved, while foyers and the stage parts were largely rebuilt, including the demolishing of the old Esplanade building and the building of a new home for the Bernhard-Theater. 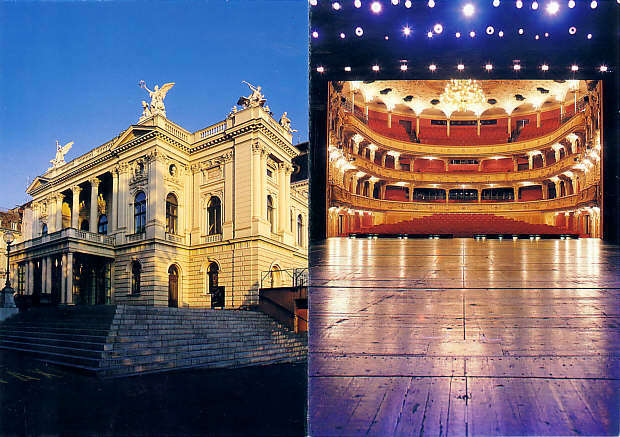 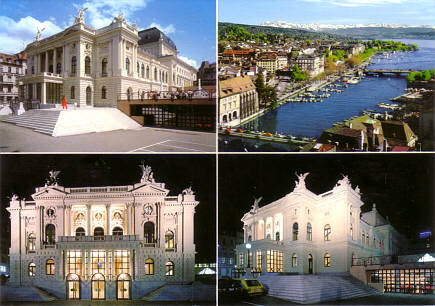 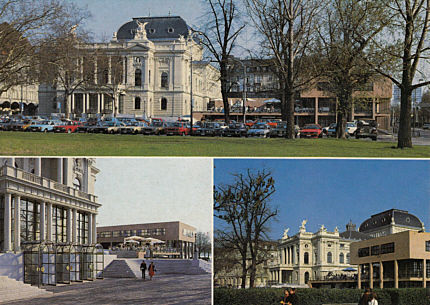 After the renovations of 1981-1984 the theatre re-opened on 2 Dec 1984 with Wagner's "Lohengrin". 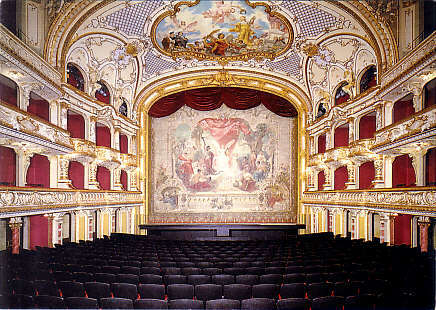 Formerly 1238 seats, today 1100 seats. 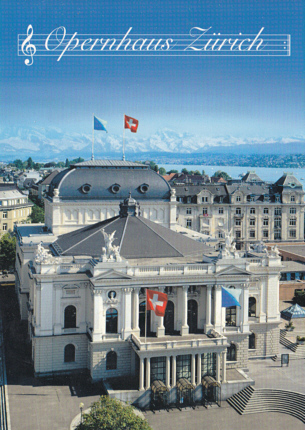 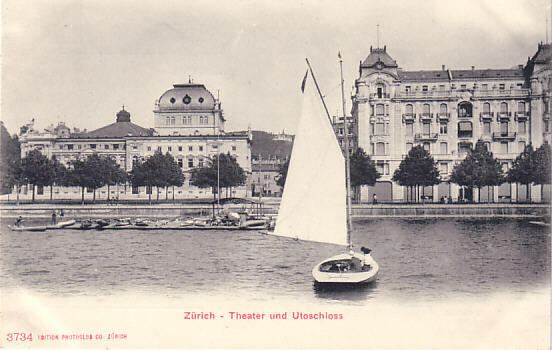 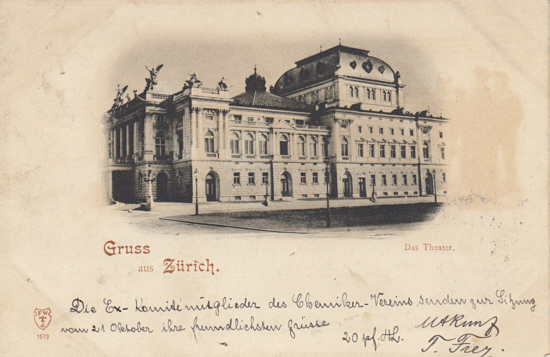 Front Text: "Gruss aus Zürich - Das Theater"
Front Text: "Zürich - Stadtheater"
Front Text: "Zürich, Stadtthaeter", "Zuschauerraum"
Front Text: "Zürich - Theater und Utoschloss"
Front Text: "Das Stadttheater in Zürich"
Reverse Text: "Zurich. 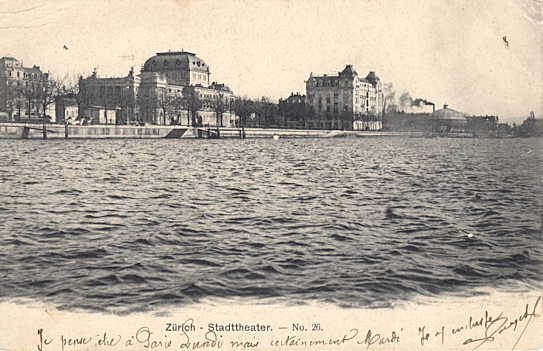 - Stadttheater"
Reverse Text: "Zürcher Opernhaus, L'Opéra de Zurich, The Opera House"
See Bernhard-Theater for another postcard of this theatre.